VaporFlex® Premium is a 7 layer co-extruded geomembrane barrier with an EVOH core layer, designed for use as a gas and moisture barrier. 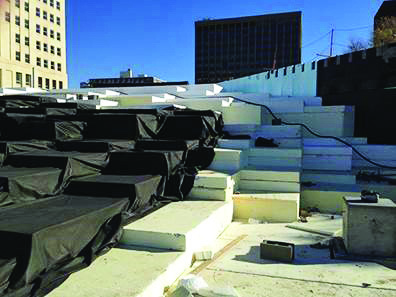 VaporFlex® Premium is a 7 layer co-extruded geomembrane barrier with ethylene vinyl alcohol (EVOH) core layer. The EVOH layer is designed to provide excellent barrier to methane, radon and other volatile organic compounds (VOCs) that exist naturally or is a result of an abandoned industrial/commercial facility suspected of polluting the soil due to hazardous waste. VaporFlex® Premium is tested to a wide range of VOCs including benzene, toluene and xylene and is offered in 30, 40 and 60 mil thickness that permits its use in a broad range of geo-environmental applications. EVOH is a flexible thermoplastic copolymer with excellent flex-crack resistance, and very high resistance to hydrocarbons, oils and organic solvents. It also has some of the best barrier properties to gases such as oxygen, methane, radon, nitrogen and carbon dioxide. EVOH is very versatile, making it one of the dominant barrier materials for a broad range of applications.